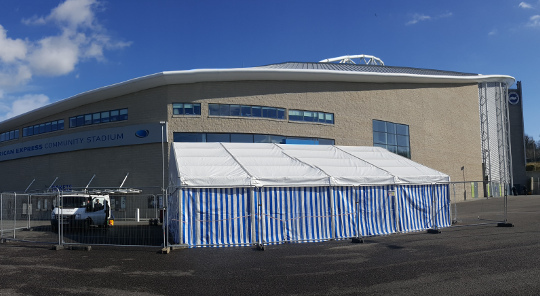 A large marquee provided the ideal temporary shelter while a local paving company installed the giant club crest at the home of Brighton & Hove Albion. Marquees are useful for many a purpose – trusted by wedding couples to protect their guests from the elements (and provide a luxurious venue, of course! ), and hired by the construction industry to protect their work and their work force. The Amex Community Stadium contracted Clearstone Paving Ltd to install an 8 metre seagull on the concourse at the impressive Brighton football ground, large enough to be seen from the railway station approach. To complete the iconic logo, in blue and white resin, Clearstone needed to securely cover the area for a week to protect their work from both visitors and the elements. The company ordered marquee hire from ABC Marquees and were delighted with our blue and white striped marquee walls, in keeping with the football team colours. The Director of Operations at Clearstone, Spencer Kennard, was also delighted by our service! “I just wanted to pass on my thanks to you and your team. Everything went as planned and I could not have been happier with the service that you provided. Brighton and Hove Albion football club were extremely pleased with the final result. I have to say a big thank you for helping Clearstone with this. A special thanks to Simon for his straight forward professionalism, liaising with myself and the estate manager of the Amex stadium certainly helped with the whole process.